Mobilize your fingers for the ultimate six-sided skirmish. Field an army of cubes and then place them strategically on the board. Each cube has special powers: Heroes and Skulks are strong on the attack, while Guards are better for defense. Once your cubes are in position, sound the trumpets and let the flicking begin. Try to knock your opponent's king off the board, aiming carefully not to get caught behind enemy lines. 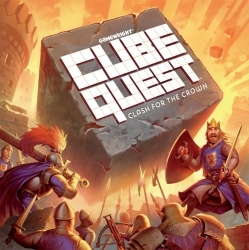 Triumph in your quest and crown yourself the Cube King.